Today, on the Feast of the Superb Owl, I got word that my shortish take on fairy tales and the Monstrous Feminine “To Increase His Wondrous Greatnesse More” is going to be published by Apex Magazine later this year. Which is happy-making. What’s even more happy-making is that I’ve been feeling a little frustrated by my writing lately, and that Apex is one of those markets that I’d sort of wondered if I’d ever sell to. And hey, I have. And I also have chicken and chocolate chip cookies. All hail the Superb Owl and her fearsome beak and catchsome claws. Because New Year’s Eve is for self-promotion: Scheherazade’s Facade is now available in print. It’s been a long time in coming, a long and strange journey, and like all the best long and strange journeys it has a happy ending. Good on ya, 2012. And good on ya, Michael M. Jones our editor, who believed in it and didn’t give up and basically made this thing happen through sheer force of will. Here’s a glass to him and to us all. So I’ve been tagged in the Next Big Thing blog hop that’s been going around, by the marvelous Catherine Lundoff – who you should really be paying attention to. I just finished her novel Silver Moon and enjoyed it hugely (menopausal werewolves; you can’t imagine what a breath of fresh air that is). Stop saying ‘fabulous’ in there. Back from Philcon. It was, in a word, fabulous. I made fabulous friends. I went to some fabulous panels (including one that was actually awful in a fairly fabulous way). I had fabulous Indian food. I met Catherynne Valente and she was fabulously gracious and remembered the essay I wrote about Silently and Very Fast and Donna Haraway’s Cyborg Manifesto. So yeah. Fabulously fabulicious. My short work of SF eco-horror, “Invasives”, is up to read for free in the current issue of The Journal of Unlikely Entomology. 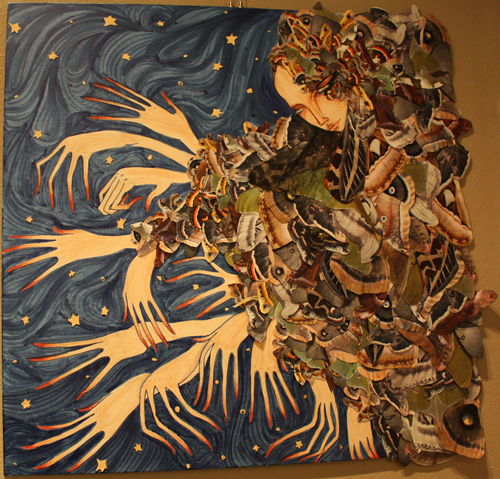 It has some awesome art. For those who care about such things, it came from an experience I had as a child camping with my father, where the trees around the campground were covered in disgusting gray caterpillars and I refused to go near them because I think on some level I was afraid they were going to leap on me. Childhood trauma for the literary win. The Scheherazade’s Facade giveaway is still technically going on here, but I decided that Tumblr might be a slightly better tool for this, so you can also enter to win there by simply reblogging. Same terms: I choose a winner at random this upcoming Friday. Goooooo. 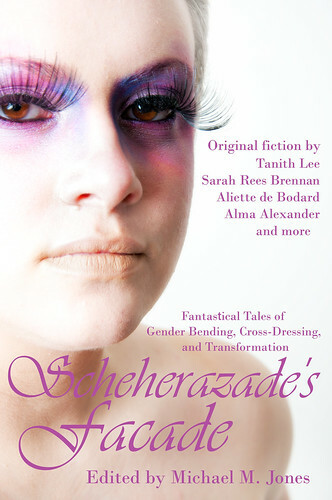 Want to win a free copy of Scheherazade’s Facade? Then just mosey on over here and follow the instructions. Not hosting the contest here because I frankly like Dreamwidth’s comment system better, and I feel like having everything in one place makes it easier to wrangle. So hey you guys, any of you remember Scheherazade’s Facade? There have always been stories of those willing to blur or transcend the traditional gender roles. Some do it out of necessity, others are merely embracing their true selves. Sometimes it’s for fun, other times survival. Every culture has their gender benders, their cross-dressers, their rule breakers. From Bugs Bunny to Mulan, Alanna of Trebond to Klinger, our folk heroes and cultural icons push boundaries and challenge expectations. In Scheherazade’s Façade, twelve of today’s most intriguing authors spin tales of magic, mystery, self-discovery and adventure, each with a twist. In these pages you’ll find shape-shifting dragons, triumphant drag queens, tragic selkies, lost princes and would-be warriors. You’ll find star-crossed lovers and mysterious travelers, cross-dressers and gender bending heroes of all sorts. Featuring all-new fantasy and urban fantasy from Tanith Lee, Sarah Rees Brennan, Tiffany Trent, Aliette de Bodard, Alma Alexander, David Sklar, Melissa Mead, C.S. MacCath, Paolo Chikiamco, Sunny Moraine, Lyn C.A. Gardner, and Shanna Germain. Basically if you like a little more queer in your SF this is probably something you want to buy. As of right now the ebook edition is what’s available but the print edition is coming soon. I also want to mention that this is the first cover I’ve co-designed (though not the first one I’ve been a model for) and I’m super-pleased with it and really grateful to have been given the chance to do it. Seriously, buy it, enjoy it, review it, get the word out about it if you like it and if this is the kind of fiction you want to support. Queer/Trans* SF still has real trouble finding a voice sometimes and word of mouth is invaluable. Per the title above: This site is three years old on the dot today! Kind of can’t believe it. They grow up so fast. In honor of the blogiversary, I’m posting a free story. It’s one that I’ve been working on for a while, that was inspired by a bunch of ideas from a bunch of different places. For those of us who prefer our fiction in audio format, I’m also including an mp3 of me reading the story. Whichever format you chose, I hope very much that you enjoy.